Last month, Forest City Washington filed to extend stage one PUD approval for 375 and 425 M Street, two office buildings proposed at the southern end of Waterfront Station. It was anticipated that the extension request would be followed by another filing to change the proposed primary use at the two development sites to residential since the developer made their intention known at the February ANC meeting. That filing was made earlier this month. The developer is now proposing two buildings with 41,870 SF of ground floor retail, 38,110 SF of commercial space on the second floor, and a total of 605 residential units above. The East building (375 M) will contain 309 units, 21,930 SF of retail and 18,660 SF of commercial space; the West building (425 M) will have 296 units, 19,940 SF of retail and 19,450 SF of commercial space. A minimum of 8% of the gross floor area will be dedicated to households earning up to 60% of Area Median Income. Four of the affordable units will be 3-bedroom apartments. 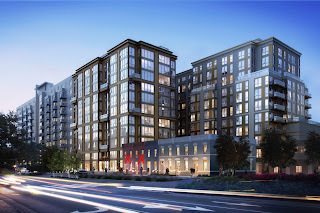 The architectural design for the East and West M buildings has been revised to accommodate residential use, incorporate effective urban design strategies, engage the surrounding public spaces, and support the unique town-center environment created by the overall project. The proposed mix of uses and architectural design for the East and West M buildings will benefit the community, enliven the streetscape, and provide additional services for residents, employees, and visitors who live and work in the neighborhood. Above the third floor, each of the buildings opens up as a C-shaped tower that faces M Street. A south-facing courtyard is located at this fourth level, with access provided to individual terraces for units facing the courtyard and to a communal outdoor recreation space for building residents. The courtyard is elevated above the three-level podium of retail, office, and residential uses, which creates a pedestrian-scale street wall with vibrant retail storefronts that maximize transparency. Parking will be provided below-grade for both buildings, with entrances off of the private drives around the site, removing the need for curb cuts along M Street. A total of 363 parking spaces will be provided, split between the two buildings. The Capital Bikeshare station currently located on the west side of 4th Street will be relocated to the east side adjacent to the Metro plaza. Originally, Waterfront Station was planned as mostly office buildings with a minor residential component. Over time, the plans were modified – first, the site where Eliot on 4th apartments now stands changed uses from office to residential. Now, the planned office buildings along M Street may now proceed as residential. The reason for the changes in use are due to evolving market conditions. The office market is not as strong as it once was, while rental apartments are now the preferred asset type. This new proposal will be brought to the ANC to garner their support; however, Chairman Litsky had concerns about the change in use when it was mentioned at the February meeting. In response to the pending demolition of the rowhomes along the 1300 block of South Capitol Street and the unit block of N street to build a 200-unit apartment building, the Southwest Neighborhood Assembly (SWNA) filed an application to designate the structures as historic with the District’s Historic Preservation Review Board (HPRB). According to the application, the six “Coleman & Richards Row” homes on South Capitol Street were built in 1892 and the seven “Banes Row” homes were constructed in 1916. The Coleman & Richards Row homes represent the oldest working-class single-family rowhomes left standing in Southwest. Most of the “obsolete dwellings” in Southwest were demolished during urban renewal, but the area east of Canal Street, south of M Street, and west of South Capitol Street was spared since at the time, most of the buildings were fairly new and in good repair. This is not the first time in the neighborhood that historic designation was used to halt or slow development. SWNA used the tactic in 2014 when the Southeastern University campus building at 6th and I streets was being demolished in preparation for development into “The Bard,” a mixed-use project with administrative and rehearsal space for the Shakespeare Theatre Company (STC) and multifamily rental housing. In that case, the neighborhood organization was able to get some concessions from the developer in exchange for withdrawing the historic application. Subsequently, the building was demolished and the site sold to STC. A Planned Unit Development was filed for the site in 2016, but it was withdrawn last summer after a backlash from neighbors over the proposed height and density of the project. It was used again when UIP and Perseus Realty had plans to build on top of a parking garage at Capitol Park Tower, located at 4th and G streets. 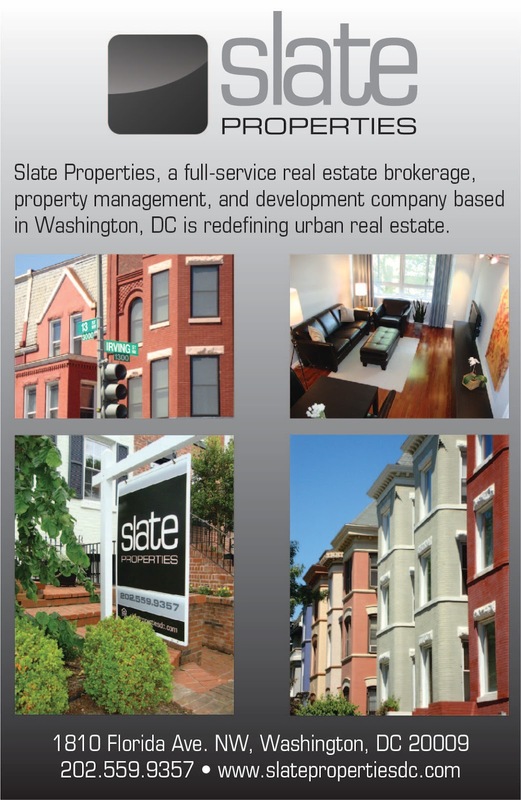 In 2012, SWNA filed an application to place Capitol Park Tower on the DC Preservation League’s endangered list. At the same time, an application was filed to designate the building and landscape as historic. After the building and landscaping received historic preservation protection, the developers needed HPRB approval before proceeding with their plans for an addition. Final approval was given in 2016, but construction has yet to begin on the project. Altus Realty Partners was expected to start construction on the South Capitol Street apartment project later this year with completion in 2019. Since a historic designation application was filed, demolition of the rowhomes and development of the apartment building will not be able to move forward until the HRPB makes a decision or SWNA withdraws their application. A little more than a week after Waterfront Park opened to the public at District Wharf, I was able to get a tour with the landscape architect for the project. The park was designed by LAB, with the assistance of a group of 35 Southwest residents (myself included) who were selected by ANC 6D to serve on a committee to design the park through a series of charrette planning sessions. Elinor Bacon from Hoffman-Madison Waterfront convened the charrette planning sessions at the request of ANC 6D, which stipulated in its approval of the stage one PUD application that the park be built in the first phase of development and a public process was needed to help design the park. Movable furniture will be added soon. Tiber Island borders Waterfront Park. Pergola and 525 Water in background. Play mounds on upper portion of park. Bocce court is still under construction. Grassy area in upper area of park. Winding path and river in the distance. Road made of crushed oyster shells. Walls made of MD carderock stone. Wetlands in lower area of park. In addition to Forest City’s request for an extension of their PUD at Waterfront Station (and potential change in use from office to residential), PN Hoffman is seeking a two-year extension for the NE parcel next to CVS. Last year, PN Hoffman won the development rights for this parcel from DMPED to build a mixed-use project with ground floor retail, a black box theater, and 443 rental apartments. While extensions have been granted for the site before by DMPED, this is the first request from the developer of the project. PN Hoffman is still working on a disposition agreement with the city and intends to start the PUD process for their proposed project next winter. Another extension is being sought for the Randall School project, a long-planned development on I Street. 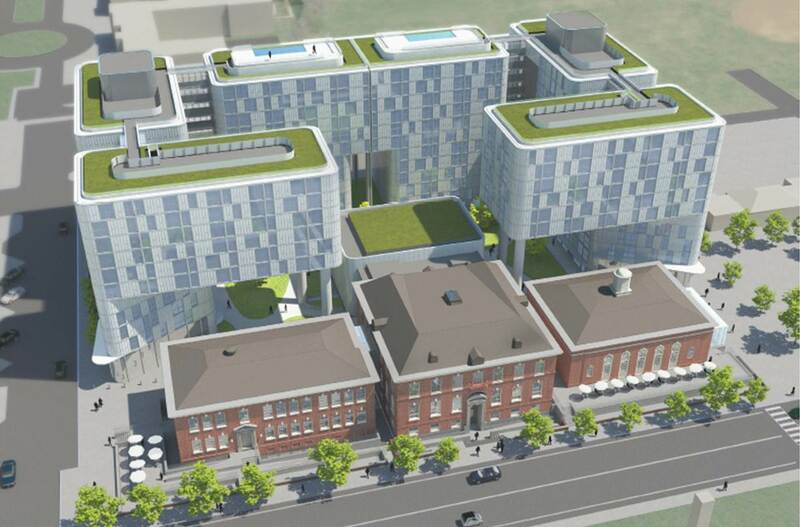 Similar to the Waterfront Station project, this extension is being sought by a new developer. Lowe Enterprises recently came to an agreement with Telesis/Rubell to become the primary developer of the project. While the main elements of the project will remain, including a modern art museum, retail, commercial space, and mixed income apartments, some changes are planned. According to the developer, the two-year extension will allow Lowe Enterprises to make modifications to the plan to make the project work financially. If the extension is granted, a building permit would need to be obtained within two years and another year for construction to commence. Abatement of the historic buildings are expected to start in late 2018, then demolition of the non-historic portion, which would likely put the start of construction in 2020. Both of these extensions were presented at the April ANC 6D meeting and were supported by the commissioners. On the Waterfront Station site, the commissioners want PN Hoffman to maintain the brick pavers and activate the site prior to construction. At Randall, Lowe Enterprises has agreed to maintain the derelict property and put up signage touting plans for development. Demolition permits have been filed for several rowhomes along South Capitol and N streets in preparation for the development of a new high-rise multifamily building next to Camden South Capitol apartments. Asbestos abatement is underway at the small rowhomes, which date to the early 1900s. A DC Council hearing was held on March 30 to get approval to temporarily close an alley off of N Street that connects to South Capitol Street during construction. ANC 6D gave its support several months ago. The alley will be the access point to the parking garage of the building, but it serves as an outlet to South Capitol Street for area residents. It will reopen once construction is complete as an easement – the air rights above a portion of the alley will be used to build the apartment project. Some of the surrounding homeowners are concerned about the proposed alley closing to construct the building, as well as potential damage to their homes once some of the rowhomes owned by the developer are demolished. A rowhome on N Street and two on South Capitol Street closest to the alley may be demolished to make the alleyway larger. Others may be demolished as well. 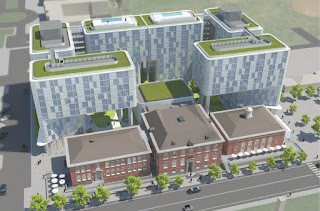 An older rendering showed six rowhomes remaining on South Capitol Street, but the latest rendering revealed at Monday’s ANC meeting shows only four, starting with the blue South Capitol Smile Center building. left would be demolished to create a green space for the project. The new rental apartment building is planned as a 250-unit project with ground floor retail, designed by PGN Architects. Altus Realty Partners is expected to start construction on the project later this year with completion in 2019. A couple weeks after the newest Shake Shack opened to the east of South Capitol Street, another one is headed south of the freeway – this one will be opening at District Wharf. This will make the third Shake Shack to open within ANC 6D. The first opened inside Nationals Park and the other opened late last month on M Street SE. According to a press release, the burger chain’s District Wharf location will be a 3,500 SF restaurant with an interior mezzanine and outdoor waterfront dining. It is scheduled to open this fall. In addition to Shake Shack, I’m hearing that Hen Quarter will be opening at District Wharf. Hen Quarter serves Southern cuisine and currently has two locations in Old Town Alexandria and Silver Spring, as well as a third one coming soon to Penn Quarter. I’ve also heard that a lease has been signed for a live music venue called Union Stage that will be approximately 6,000 SF. Union Stage is from the same group that operates Jammin’ Java in Vienna, VA. Although it’s not known yet how Union Stage will be operated, Jammin' Java is a 200-seat club, bar and cafe that offers daily live music and features Tot Rock during the day, which is a family-oriented music series. Music lessons are also offered. Here’s some additional information about previously announced Kirwan’s on the Wharf from Mark Kirwan, which has applied for a tavern license. The Irish pub will be located at 749 Wharf Street and will have 181 seats – a summer garden will have 142 seats. Indoor live entertainment will be offered Thursday through Sunday. According to the license application, the tavern would stay open until 2am during the week and 3am on weekends. Live entertainment would end by 1am as well as use of the summer garden on weekends (midnight during the week). Meanwhile, Pearl Street Warehouse is also applying for a tavern license. The tavern will be located on the new Pearl Street (33 Pearl Street) and is proposing a 155-seat venue with a total occupancy load of 300. There will also be live music daily and diner-style food will be served. The proposed closing time during the week would be 2am and 3am on weekends. Live entertainment would end at 2am on weekends and 1am on weeknights. District Hardware and Bike wants to operate a café within the bicycle shop that would serve alcohol until 7pm on Sundays and 8pm every other night. The shop would be open from 8am to 8pm on Monday – Saturday (alcohol sales would start at noon) and from 10am to 7pm on Sunday (alcohol sales would start at 11am). The café would have 30 seats with a total occupancy load of 100.